If you aren’t lifting weights or doing some type of body weight-based resistance training, you may be harming your health. Here’s 10 reasons why strength training is an essential for health. And, if you’re a woman who doesn’t want to “bulk up,” don’t worry, you won’t. You can expect to enjoy a body that is stronger, leaner and more athletic. Beginning in your 30’s, 3 to 5 percent of your muscle mass will be lost each decade if the individual is not physically active. Strength training reduces the risk of age-related sarcopenia. (Sarcopenia is the medical term for low muscle mass). In other words, strength training helps people feel healthier even as they age! 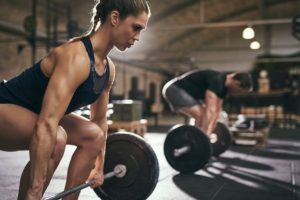 Most of us know that strength training promotes muscle growth and connective tissue growth. Strength training causes damage to muscle, but in the recovery period, the muscle is repaired with protein. The repairing process or you can call it the recovery process is what promotes more muscle. Strength training promotes fat loss and not muscle loss! This is very important for those looking to shed some pounds. The more muscle we have, the higher our metabolism will be. When an individual is dieting and not doing strength training, there will be muscle loss. It is estimated that up to 25% of weight lost is muscle! Strength training can help people lose a lot more fat, look slimmer and have more shape to their body. Seems like a win-win! Weight training exercises teach us to have more balance. Good stability needs strong muscles in the core, hips and ankles. Strength training can promote good posture as well. You will burn more calories at rest! This is because the amount of lean muscle you have determines the number of calories that are burned throughout the day. Even if you are just sitting down, you will burn more calories. In other words, strength training increases your resting metabolism. Strength training does have amazing benefits! Working out those muscles helps strengthen the bones. When the bones are strengthened, the risk of injuries and bone loss are decreased. The risk of osteopenia and osteoporosis are also decreased when strength training is added to the workout routine. And if you have arthritis, strength training is one of the best ways to help increase joint range of motion and alleviate pain. Like all physical activity, strength training promotes better sleep. It reduces stress and decreases insomnia. It also improves resting glucose metabolism, which plays a role in restful sleep. Resistance or strength training has so many benefits for the mind. First, it reduces anxiety and stress, which usually interfere with a good night’s sleep. Strength training is an excellent intervention for those who suffer from symptoms of anxiety, such as persistent worry or fear, fast heart rate and rapid breathing. Second, it reduces chronic fatigue and reduces depression. In addition, strength training improves memory and self-esteem. These are only some of the benefits in regard to mental health! So even if you do not have diabetes, improvements in blood sugar still has benefits. For those with diabetes, improved blood sugar is even more important. Improved blood sugar means more energy because there will be less spikes of blood sugar throughout the day. Less blood sugar spikes means that blood sugar will remain more stable. There may be no more 3:00 PM sluggishness, especially if protein is consumed with a carbohydrate source when snacking or eating a meal. As you can see, strength training has amazing benefits. If you are a beginner, start by doing resistance training two times per week. Make sure you give your body rest to repair and recover from each workout session that trains the same muscle group (24-48 hours of rest is sufficient). Also, aim for 20-25 grams of protein 30-60 minutes post-exercise. This article is by Kathryn Kelley-Whetstone, a dietetic intern with Appetite for Health.